Maybe I should rather ask this under "You Know You're A Space Geek When..."
I'm trying to sort out some discrepancies in the history of the SOCTOP payloads. Maybe someone of you has access to the missing link. Any help is much appreciated. Here is the problem. I'm trying to identify all SOCTOP missions. Seems like an easy task (using the documents released by the NRO under the FOIA). But I can't get all the given details matching. So, how many SOCTOP launches we have to deal with? And which source is correct about on which missions the SOCTOP's where flown? If there were really ten missions, what about the missing ones? One could be Discoverer 35. The other one? Is there any information on S.T.LOW? Closely related to SOCTOP or not? JCM, Skyrocket, Blackstar, anyone else...? "And the sky full of stars: American signals intelligence satellites and the Vietnam War"
I just acquired the 2012 book "A-6 Intruder Units of the Vietnam War" by Rick Morgan. Pages 75-76 refer to Operation Pocket Money, the mining of Haiphong Harbor. This book says that there were three A-6 Intruders, not four, conducting the initial raid. 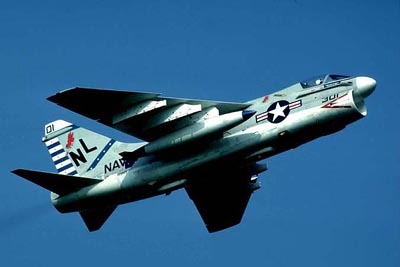 They led six A-7E Corsairs (pictured). All the aircraft carried mines (the Intruders carried bigger ones). The really interesting claim in the book is that although President Nixon announced that the mines would become active after 72 hours, the mines had actually been set to become active after 48 hours. Obviously there was some kind of miscommunication. That could have been a big problem--imagine what would have happened if a Soviet freighter left Haiphong after 50 hours, the captain thinking that he still had 22 hours of safety, and detonated a mine. That would have been bad. I wonder if Nixon's announcement was amended? Alternatively, the rush to get satellite surveillance of the area could have been tied to this, trying to find out if any ships had been damaged by mines after two days. There has to be an after-action report on this operation in Navy files somewhere. But I'm not an expert on US Navy history, and I'm not about to go on a research effort on this without having a better understanding of the topic. So, how many SOCTOP launches we have to deal with? No, I don't. See source  in my list. The question is: does this document 'confirm' anything? Other documents doesn't mention these specific launches. And that's my problem. Sorry, my fault for missing your ref . I get the impression that these payloads were considered fairly minor and not always included in the detailed lists. There is a similar problem in trying to track down all the later BIT payloads with the same purpose. I'd be inclined to treat a positive mention as indication that a payload was carried, but not take a lack of a mention as indication that one definitely wasn't included. I think you have got it right. I'd be inclined to treat a positive mention as indication that a payload was carried, but not take a lack of a mention as indication that one definitely wasn't included. Probably the best explanation I can get. Thank you for sharing your thoughts. Just putting it here. Came across this. So I've managed to locate some additional information on this event. What I wrote above is true, with a few corrections. Apparently the timers on the mines had a standard deviation. If they were set for 72 hours, some of them could go active as soon as 58 hours and some as late as 80 hours. The Navy did not learn about this until shortly before Nixon was scheduled to give his speech, and they were rather frantic (and officials were embarrassed). They apparently amended Nixon's speech to say something like "three daylight periods" which was close enough without being exact. But there are journal entries from senior Navy officials about how big a deal this was, and how disastrous it could be if the president gave a deadline and then a ship set sail before the deadline and got sunk by a mine. I think that this does a lot to explain why the Navy scrambled to request that the NRO use the satellites to monitor maritime traffic in the region after the mining of the harbor--they nearly screwed up big time and they needed to make sure that everything went smoothly. Fascinating. "Operation Pocket Change" from launching diversionary attacks, giving US guided missile cruisers free fire authority from 500ft on up with their RIM-8 Talos missiles against MiGs(2 missiles fired 1 MiG destroyed), the actual opening round of mining operations, the drowning of an Admiral and his staff in a helicopter accident, to the actual dropping of the mines, which began at 8:59 local with the flight leader radioing the carrier that all mines were in the water at 9:01am local, while concurrently President Nixon was giving his speech. This operation had huge strategic importance. 1)Would the orbital monitoring of maritime traffic during this critical period be primarily using photo-recon assets? 2) Since the mining finally occurred in May 1972, would the recon satellites of the time only monitor/document marine traffic for later use. There was no realtime or even neartime capability correct? The mines apparently were recovered(mostly) during Operation End Sweep in 1973. I did not see this earlier post. 0-Yes. It was quite an operation. I'll post some reference books. There are some first-hand accounts by the pilots. 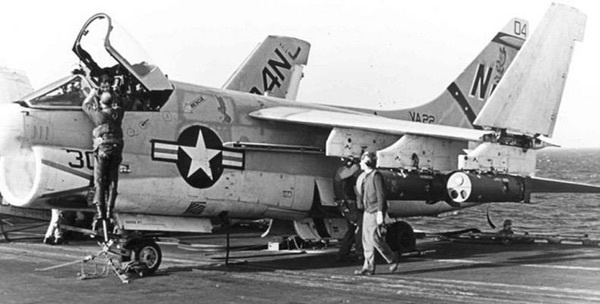 It seems like the specifics of the mining operation were planned aboard USS Coral Sea, and nobody had much experience with dropping mines from jets. 1-No. SIGINT. Read my article. Photo-recon satellites still used film. Recovery would take days. I am sure that they wanted recon images of the actual harbor. That could have included aircraft photography. I dunno about any SR-71 missions over North Vietnam in that time period. But they certainly would have wanted to know what ships were in the harbor that they were about to mine. 2-Again, read my article. The entire point of it was the use of national (i.e. strategic, not tactical) SIGINT assets for a tactical operation. 3-I need to find good (i.e. 300+ dpi) images of the mines and of the aircraft. That may require some actual foot research on my part, like a trip to NARA College Park or to the Naval Research Center at the Navy Yard. I work in Washington, so research trips like that are not that difficult. It's just that my day job gets in the way of my hobbies. 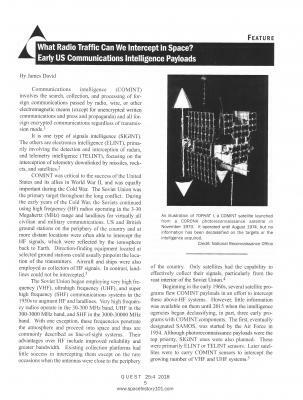 A subject that I want to turn my attention to is the use of SIGINT satellites to gather intelligence on Soviet anti-ballistic missile (ABM) radars during the 1960s. I'm not planning on doing an exhaustive article on this subject, but there's some intriguing stuff. This is an image that I missed that is contained in one of the SIGINT documents declassified last year. It shows a proposed modification to the MULTIGROUP satellite to add new antennas and focus on the ABM problem. I have not dug into the topic in any depth yet, but it appears that they did not build this. The non-disclosed P-989/P-801/P-226 subsatellite group similar to the P-11 series - really SIGINT? In December 1968 a new class of subsatellite appeared - which were labeled mostly as "Subsatellite Ferret Type C". Reportedly they were focused on Soviet ABM radars and flew at a higher altitude of 1200–1400 kilometers at about 80.3 to 96.9 degrees inclination. These satellites were apparently given the designation Program 989, P-801 or P-226. A released NRO document has a chronic of all SIGINT launches, with some redacted gaps (see attachment or http://www.nro.gov/Portals/65/documents/foia/declass/sigintphaseii/SC-2017-00007hhhh.pdf). Interestingly, the list contains unredacted numbers of missions by year. (Note: some satellites like the STRAWMAN and some of the P-11 series carried dual or triple mission numbers, while the quadruple POPPY satellites apparently had jointly a single mission number). I tried to match these gaps with the still classified series (CANYON, RHYOLITE, JUMPSEAT and P-989/P-801/P-226. This opens up the question, what the P-989/P-801/P-226 really are, if they are not SIGINT satellites. If they are not SIGINT, then perhaps a store-dump-communications mission is not too far fetched (similar as the Soviet Strela-2 satellites, which were used for transmission of messages by field agents), as the equipment for this mission would be not too different to a COMINT mission. 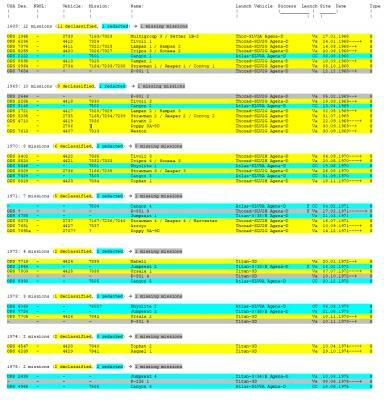 Not sure where this goes, but spacetrack.org has started releasing orbital elements of DOD satellites that they haven't released in the past. They even confirmed on twitter that the release was intentional.